Popularly known as the “Queen of Hills”, Mussoorie is a charming hill station, 34 kms from Dehradun, situated at an altitude of 2500 meters above sea level in the beautiful Gharwal Hills. Mussoorie is one of the most frequently visited hill stations in India. It provides excellent respite to people who want relief from the hot sultry conditions of the plains, especially since it is close enough to the capital to make just a weekend trip. Anglican Church. The town’s immense natural beauty and pleasant climate makes it a perfect destination for a peaceful holiday with friends and family. 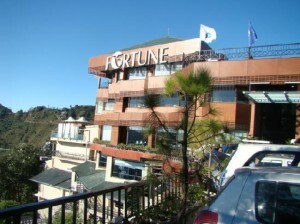 Nestled in this hill getaway of majestic glory, we have our Fortune Resort Grace perched cozily on a pine covered hill slope with an enchanting view of the valley. The resort is located at the Library End of the Mall Road, yet it retains the charm of a quiet country resort. This is a place for leisure, recreation, family and corporate bonding, and a select venue for conferences. If you have not decided yet or wants to customize tour itinerary or hotels listed above in "Fortune Resort Grace, Mussoorie Summer Package by Fortune Hotels Rs.6999/-", then we can change the travel itinerary and make a personalized, tailor-made holiday package, especially for you. We can modify this travel package as per your itinerary, budget, duration and the tourist places you would like to visit, including transportation and airfare should be included or not. Please fill the form below to contact us.